In Q2 2015, Erdene geologists conducted a follow-up exploration program on the southern portion of the Khundii license leading to the discovery of the Bayan Khundii (Rich Valley) prospect, located approximately 3.5 km south of the Company’s Altan Arrow gold prospect. During Q3 2015, an exploration program was completed at Bayan Khundii consisting of rock chip/grab sampling, trenching and geological mapping. Two separate mineralized zones were identified; the Main Zone and Northeast Zone. (i) The samples above have been collected from both outcrop and sub-crop. The veins range from cm to 1m in width however the samples in the table above are not representative of continuous mineralized zones, although the trench results displayed below do provide continuous sampling and provide a good indication of grade and thickness at surface. 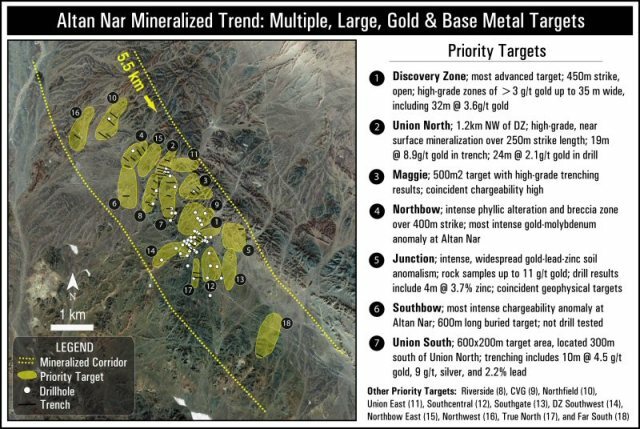 A second mineralized area, the Northeast Zone (“NE Zone”), located 600 m to the northeast of the Main Zone, contains an alteration area measuring 300 m by 300 m, and returned highly anomalous results with up to 4 g/t gold. The two zones are separated by younger, possibly overlying, lithologies and recent sediments. (i) Reported intervals represent horizontal surface intersection within trenches. The orientation of the mineralize zone, and therefore the true width, has not yet been determined. The Bayan Khundii discovery is located in southwest Mongolia on the Company’s 100%-owned Khundii license, located 15 km south of the Company’s flagship Altan Nar gold-polymetallic project. The northern portion of the 4,500 hectare license contains the Company’s Altan Arrow gold-silver prospect where previous exploration by Erdene identified a 1 km square area of anomalous gold-silver mineralization, including some high-grade gold veins (up to 57 g/t from rock chip samples and up to 31.4 g/t over 1m in trenching). In Q2 2015, Erdene geologists conducted a follow-up exploration program on the southern portion of the license leading to the discovery of the Bayan Khundii (Rich Valley) prospect, located approximately 3.5 km south of the Company’s Altan Arrow gold prospect. Erdene Resource Development Corp. is a Canada-based resource company focused on the acquisition, exploration, and development of base and precious metals in underexplored and highly prospective Mongolia. The Company holds four exploration licences and two mining licences located in Southwestern Mongolia. These include: Altan Nar – an extensive, high grade, near surface, gold-polymetallic project that the Company is aggressively advancing toward a production decision; Khuvyn Khar – an early-stage, copper-silver porphyry project with multiple drill targets and significant copper intersections; Zuun Mod – a molybdenum-copper porphyry deposit; and Altan Arrow – an early-stage, high grade, gold-silver project. In addition to the above properties, the Company has an Alliance with Teck Resources Limited on regional, copper-gold exploration in the prospective Trans Altay region of southwest Mongolia. For further information on the Company, please visit www.erdene.com. Erdene has 97,277,377 issued and outstanding common shares and a fully diluted position of 113,899,988 common shares.